Should Common Sense Be the Enemy of Sociology? How do you discuss common sense in your classes? 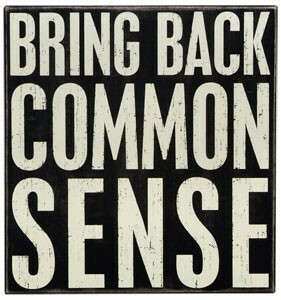 During my first few years of teaching I used to assassinate common sense as the enemy of sociology. But I no longer do. Studies of cognition have shown that it is near impossible to learn new ideas until we are able to connect them to things we already understand (Bransford and Johnson 1972; Resnick 1983). This suggests that our intro level students are almost certain to connect the things you are teaching them to their already established common sense beliefs. Hostility to common sense then, threatens the very foundation your students will use to learn sociology (Mathisen 1989). Furthermore, interpretive theories and concepts like Weber’s Verstehen cannot be understood without considering how common sense is used to make meaning. When we honor our students’ common sense understanding of the world, we show them respect and acknowledge where they are in the learning process. Today I treat my students’ common sense as their baseline for understanding. I start from what they already know and then move toward an empirical understanding of the world. If they are going to start with common sense anyways, why not join them? Bransford, John D., and Marica K. Johnson. 1972. “Contextual prerequisites for understanding: Some investigations of comprehension and recall.” Journal of Verbal Learning and Verbal Behavior 11:717–726. Maithisen, James A. 1989. “A Further Look At ‘Common Sense’ in Introductory Sociology.” Teaching Sociology. 17:307–315. Resnick, Lauren. B. 1983. “Mathematics and Science Learning.” Science 220:477–478. It's so interesting - as an editor, I often see either the withering commentary "Sociology confirms the obvious!" or the somewhat trite intro, "Most people think... but sociology finds..." It's as though the only options for researchers are to debunk or "complicate," "interrogate," or "problematize" commonsense or taken-for-granted notions. It's definitely a great function of soc, but there's so much more out there; connecting and acknowledging lived experience, isn't that what the Thomas Theorem's all about? Hi Nathan, I'm just wondering if this has changed your thoughts on the utility of Duncan Watts's book in your classroom. Does using "Everything if Obvious" fit in to your new-ish way of teaching about common sense?